Men Invicta Reserve Speedway Valjoux 7750 Automatic Rose Gold Swiss Watch New. 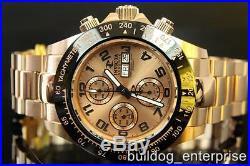 MENS INVICTA RESERVE SPEEDWAY SWISS MADE AUTOMATIC VALJOUX 7750 CHRONOGRAPH WATCH. High velocity style geared with a powerful Swiss Valjoux 7750 movement and tuned up with relevant complications for those who prefer a faster pace of life. Driven by a prestigious Swiss ETA 7750 Valjoux Automatic Chronograph movement, this Speedway timepiece from Invicta Reserve boasts a 45mm round stainless steel case in rose-tone topped by a fixed black bezel decorated with a tachymeter scale. An exhibition case back provides a window into the meticulous calculation of the design's remarkable engine. Arabic numerals occupy all hour positions on the round dial which comes in rose-tone. Day and date windows appear next to 3:00. Subdials in 12-hour, seconds and 30-minute formats exist near 6:00, 9:00 and 12:00, respectively. The Swiss Made stamp parks around 6:00. Luminous Tritnite accents the hour, minute and chronograph hands. A stainless steel bracelet in case coordinating color executed in a combination of polished center links and brushed outer links secures with an Invicta Reserve logo etched push button dual deployant clasp. Movement: Swiss ETA 7750 Valjoux Automatic Chronograph w/ 26 Jewels. Crown: Screw Down w/ Function Pushers. Clasp: Push Button Dual Deployant. Bracelet Measurements: 8-1/2 L x 22mm W. Water Resistance: 50 ATM - 500 meters - 1650 feet. About Swiss Made timepieces Timepieces with the "Swiss Made" label enjoy a solid reputation for quality craftsmanship and aesthetic appeal. Since the 16th century, Switzerland has been the epicenter of watch making producing some of the industries greatest technological advances. Flame Fusion Invicta has boldly stepped into the fire and re-emerged with yet another technical achievement. In a process utilizing high heat, high pressure and an Aluminum Oxide combination, the mineral (glass) and Sapphire properties are fused together. This unique fusion results in the impact resistance of a standard mineral crystal and offers the scratch resistance of the Sapphire. Flame Fusion is one more way in which Invicta continues to set new, superior standards, making their timepieces the exception to any rule. The Significance of Invicta's Reserve Collection An infinite truth about time is that it never stands still. At Invicta, we also find ourselves in constant motion and growth, hot on the trail of capturing that elusive second and giving it style and charm. At the pinnacle of our evolution comes the Invicta Reserve collection. Like a fine aged wine or a rare collectible, the Reserve line represents an apex. Each limited production timepiece is hand crafted with acute attention to detail, from the movement to the materials. We've poured all of our passion, knowledge and individuality into this line in hopes of capturing you, our loyal customer, who has witnessed our growth first hand. Be a part of the select few who experience this new level of watch making and stand proud as part of yet another chapter of Invicta history. Rest assured, your watch will come fully insured. International packages are full insured by ShipSurance. We are not responsible nor have any control over custom delays. Item must be in the exact condition it was sent out with all tags and protective plastics intact. More On Water Resistance: If your item is a chronograph, never use chronograph functions in water. Just because a watch might be stamped "100 Meters Water Resistance" does not mean you can dive to 100 meters. PLEASE READ THESE HELPFUL LINKS ABOUT WATER RESISTANCE BEFORE GETTING YOUR WATCH WET. Add a map to your own listings. The item "Men Invicta Reserve Speedway Valjoux 7750 Automatic Rose Gold Swiss Watch New" is in sale since Sunday, November 13, 2016. This item is in the category "Jewelry & Watches\Watches, Parts & Accessories\Wristwatches". The seller is "bulldog_enterprise" and is located in Houston, Texas.